I’m a huge fan of brain teasers. I love pitting my mind and mental quickness against word puzzles and other challenges, so brain teasers are perfect. 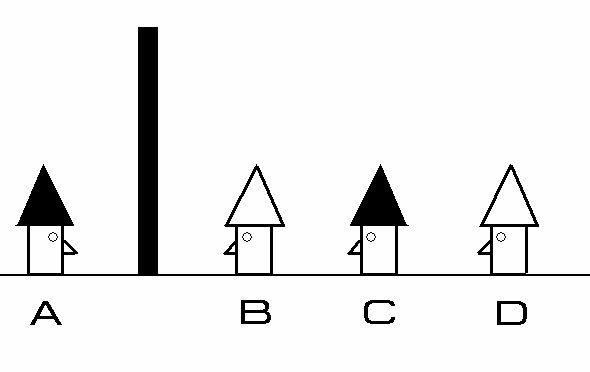 A terrific example of a quality brain teaser appeared here a while back: the Men in Hats problem (pictured above). It’s a great brain teaser because it’s deceptively simple, but requires careful, outside-the-box thinking to figure out how to solve the puzzle. But there’s another kind of brain teaser out there that’s not intended to be solved. These are more tricks or bits of wordy gamesmanship than brain teasers. I like to think of them as brain melters. True or false? Thare are five mistukes im this centence. Now, parsing it out, you can see the misspelled “thare” (1), the misspelled “mistukes” (2), the misspelled “im” (3), and the misspelled “centence” (4). You see? You soon find yourself in a brain-melting loop that never goes anywhere. It’s like the barber who shaves only the townsmen who don’t shave themselves. So does he shave himself? If he does, he doesn’t. If he doesn’t, he does. At first glance, this seems simple. There are four options, so the chances of being correct should be 1 in 4, or 25%. But wait. Two of the answers are “25%”, meaning that A AND D could lead to the right answer, so those odds become “50%”. But “50%” as an answer only appears once, so the chances of choosing “50%” are only 25%. And if you keep following that chain of thought, you circle around and around and around, going from 50% to 25% and back again while your brain dribbles out your ears and down into your shoes. Beware the brain melters masquerading as brain teasers, my friends. This entry was posted in Puzzles and tagged brain melter, Brain teaser, Geeking Out, men in hats, Puzzle to solve, Puzzlin' fool, Wordplay by gmdirect. Bookmark the permalink.